I have been a blog partner of Chinook Designs for a while, and Mellisa finally got back around to doing the design team again! This time I was chosen, and we were given a very cool twisty bead, which you can find here in her shop! Here's a photo of my bead, it's purple and very cool! I used brown leather cord I purchased from Melinda Orr and made my own cord ends. That was very tedious, but I'm glad I know how to do it now! I also made the dangle from one of my own lampwork beads, a rhinestone rondelle, and a pretty potato pearl, to give the cord a little bit of femininity. Please go to Mellisa's blog to see who else is playing along with this design challenge! It was fun, and I'm sure there are many other imaginative ways you can use this twisty bead! Cool necklace - love the leather cording with the twisty bead! 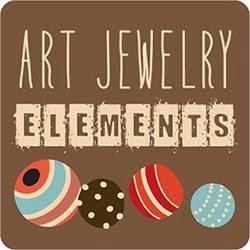 AJE Component of the Month Reveal! A Revelation! And A Mini-Tutorial! AJE Component of the Month - ME!